One of the Best-Selling, Most Award-Winning Video Add-ons of All Time! Anything your camcorder can see, any image on your VCR, any scene on TV, can now be a stunning high-resolution picture on your PC! Snappy is one of the best-selling, most award winning video add-ons of all time. Based on proprietary custom chip technology from Play's R & D labs, this is the breakthrough product that changed the industry forever. Just plug the stylish Snappy hardware module into your PC or laptop parallel port. 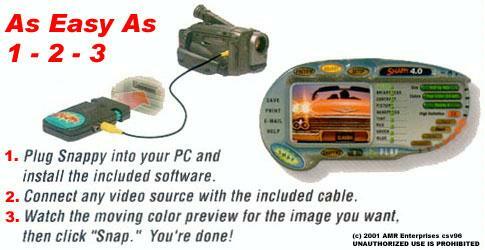 Then connect any camcorder, VCR or TV with the included cable. Watch your PC screen, and when you see a picture you want, click SNAP. It's really that simple! With the press of a single button, Snappy captures breathtaking images at record-breaking resolutions up to 1500 x 1125. It's perfect for thousands of uses from desktop publishing, presentations, databases, faxing and emailing, website pictures, creating PC photo albums, school reports or just having fun! What's New in Snappy 4.0? SnapPad makes it easy to change and compare modifications of image attributes. Your pictures are right there at your fingertips. Just click on a picon and edit it as you wish. The new image is generated and displayed in the SnapPad with all the others. It�s a super-quick reference tool, too. When you shut down SnapPad your pictures aren�t lost and you don�t have to save them, either. SnapPad remembers your pictures and loads them the next time you open it up. When you put Snappy to work snapping pictures of everything in sight, your hard drive will be absolutely stuffed with images before you know it! If you�re like everybody else, after a while they�ll wind up scattered all over your hard drive. So how will you find that one picture of Grandma from last summer when you can�t remember where the heck you put it? With Picture Explorer of course! Just launch the Search function in Picture Explorer and it goes to work searching your system for all of your pictures. Once it�s found them all, it displays them as picons (picture icons) in a central location for easy browsing and selection. Performer is a fun, easy-to-use, drag-and-drop Gizmo that lets you use your own pictures, music, or voice to make any kind of slide show or presentation you want. To get you started, we�ve included special effects, music and sound clips, and a whole library of art. The interface is intuitive and easy to use. Performer has even been used to create nationally-aired tv commercials! This is a new function we are really excited about adding to Snappy. Now you can rotate your snapped images using predefined settings, or perform custom rotations with the new Horizon Bar. This great innovation lets you choose the exact amount of rotation to add to any picture. There's no guessing�just place the Horizon Bar on the image and line it up with whatever it is you want to be perfectly horizontal. Press the Process button and it�s done. Snappy rotates the image precisely into the alignment you choose. With earlier versions of Snappy you were limited to proportional aspect ratio cropping. In other words, you could only crop images into smaller versions of the same shape. Not with Snappy 4.0! We�ve added a free-form cropping tool to the Picture Window. Now you can crop an image to a rectangle of any proportions you want. In an extensive look at Play�s new Snappy Video Snapshot 4.0, PC World magazine calls the popular video-capture device an easy-to-use peripheral with tremendous software additions. Those extras include the Snap Pad, a film-strip window that archives each image a user snaps and allows users to reprocess (crop, re-size, adjust the color, etc.) the image later; and an Internet-preview option that allows people to use a slider bar that, when dragged back and forth, displays how an image will look at different compression rates in real-time before they add it to a Web site or e-mail it. Other additions to the package include Play's own Performer software, which allows users to create full-screen, 60 frame-per-second shows with pictures, special effects, stereo music, narration and sound effects; and Picture Explorer, an easy-to-scroll-through bin that automatically finds all the images on a user�s hard drive and displays them on one convenient screen. Miastkowski makes special note of Play�s proprietary HD-1500 chip, which allows Snappy to capture images at high resolutions. �The results can be quite stunning, even when you hook Snappy up to an inexpensive camcorder,� Miastkowski says. The Snappy Video Snapshot is a pocket-sized device that brings high-resolution still images from any video source (such as a camcorder, VCR or TV) into Windows PCs. 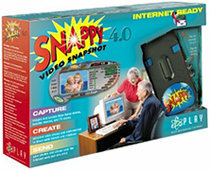 Snappy is often credited with single-handedly establishing the video-capture market. It�s used by the FBI, CIA, NASA, national magazines and television stations, as well as families, Web masters, and desktop publishers�literally anyone who needs an easy and inexpensive way to capture great-looking images from video. Snappy has been recognized with more than 25 industry awards, including PC Magazine's Technical Excellence Award and Popular Mechanics' Design and Engineering Award.